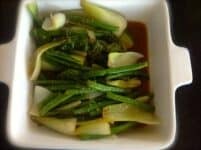 Asian Greens - simple and delicious low carb side dish. Asian greens are a fabulous and easy vegetable side dish for many low carb dinners. 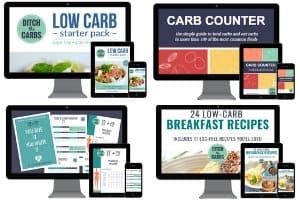 Click here to see more low carb side dishes and if you are new here, this page may help you. This is such a vibrant dish and full of garlic. I can’t believe my children went back for more! I stole the idea when we recently visited a Vietnamese Restaurant. I don’t know what was in theirs, but I came up with this version which is pretty simple and incredibly tasty. So many meals can easily be made low carb if you change the side dishes it is served with. Remove the pasta, rice, bread or potatoes and go for leafy greens, salads and creamy sauces instead. For more vegetable recipes your children will love, take a look at the recipe finder. In a saucepan, melt the butter and fry gently the spring onion and garlic until cooked but still soft. Add the bok choy (white stem and leaves) and green beans then fry gently until all covered by the garlic and butter. Add the beef stock to the saucepan. Simmer for 5 minutes until cooked. Why do you not have very many vegetable recipes? You may not have seen this post or these archives. Take a look.